Mathematical Ideas 13/e, captures the interest of non-majors who take the Liberal Arts Math course by showing how mathematics plays an important role in everyday life. With a fresh, new focus on math in the workplace, this program shows students how math will play an important role in their future, while encouraging them to understand and embrace the mathematical concepts. Vern Heeren grew up in the Sacramento Valley of California. After earning a Bachelor of Arts degree in mathematics, with a minor in physics, at Occidental College, and completing his Master of Arts degree in mathematics at the University of California, Davis, he began a 38-year teaching career at American River College, teaching math and a little physics. He coauthored Mathematical Ideas in 1968 with office mate Charles Miller, and he has enjoyed researching and revising it over the years. It has been a joy for him to complete the thirteenth edition, along with long time coauthor John Hornsby, and now also with son Christopher. These days, besides pursuing his mathematical interests, Vern enjoys spending time with his wife Carole and their family, exploring the wonders of nature near their home in central Oregon. John Hornsby joined the author team of Margaret Lial, Charles Miller, and Vern Heeren in 1988. 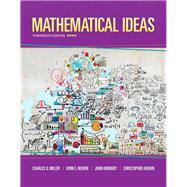 In 1990, the sixth edition of Mathematical Ideas became the first of nearly 150 titles he has coauthored for Scott Foresman, HarperCollins, Addison-Wesley, and Pearson in the years that have followed. His books cover the areas of developmental and college algebra, precalculus, trigonometry, and mathematics for the liberal arts. He is a native and resident of New Roads, Louisiana. Christopher Heeren is a native of Sacramento, California. While studying engineering in college, he had an opportunity to teach a math class at a local high school, and this sparked both a passion for teaching and a change of major. He received a Bachelor of Arts degree and a Master of Arts degree, both in mathematics, from California State University¿—Sacramento. Chris has taught mathematics at the middle school, high school, and college levels, and he currently teaches at American River College in Sacramento. He has a continuing interest in using technology to bring mathematics to life. When not writing, teaching, or preparing to teach, Chris enjoys spending time with his lovely wife Heather and their three children (and two dogs and a guinea pig). NOTE: Trigonometry module and Metrics module available in MyMathLab or online at www.pearsonhighered.com/mathstatsresources.